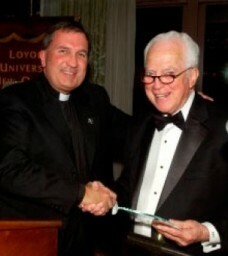 Loyola University New Orleans College of Law alumnus and retired Louisiana Supreme Court Chief Justice Pascal F. Calogero Jr., J.D. ’54, H ‘91, is the recipient of the 2013 St. Ives Award, the highest honor awarded by the College of Law Alumni Association. The St. Ives Award, named for the patron saint of lawyers, is presented annually to alumni who have volunteered services to the College of Law or the university, maintained the highest standards of the profession and furthered the mission of the alumni association. Calogero will be honored at the College of Law Alumni Luncheon Friday, Feb. 22 at the Ritz-Carlton New Orleans. For more information on attending the luncheon, contact Bart Folse at 504-861-5555. “During my 36 years on the Louisiana Supreme Court and 20 years practicing law, I strived always to honor the principles of law and social justice that I was taught at Loyola. It would require a tome unto itself to recognize the many talented law clerks and tremendous Supreme Court staff who helped in my effort to lead our judiciary in service to all of Louisiana’s people. And, I am grateful to so many others, especially to my wonderful family, without whom my career could not have attracted an honor such as Loyola’s prestigious St. Ives Award,” Calogero said. Calogero, the longest-serving justice in the history of the Louisiana Supreme Court, received his Juris Doctor from Loyola’s College of Law in 1954, where he graduated first in his class and was president of the Student Editorial Board of the Loyola Law Review. From 1954 to 1957, Calogero served in the U.S. Army and then was a law clerk to the judges of Civil District Court in Orleans Parish from 1958 to 1972. Calogero was elected to the Louisiana Supreme Court in 1972 and took his first oath as associate justice in January 1973. He was re-elected in 1974 to a 14-year term on the court and was re-elected again in 1988 and again in 1998. As an associate justice, he was a member of the Supreme Court’s Judicial Council and the Judicial Ethics Committee, served as the state court representative to the National Center for State Courts, was chairman of the Supreme Court Budget Committee, and served as chairman of the Judicial Budgetary Control Board. Sworn in as chief justice of the Louisiana Supreme Court on April 9, 1990, he served as the chief administrative officer of the Louisiana Court System, chairman of the Judicial Ethics Committee, the Judicial Council, and the Human Resources Committee and as a member of the National Conference of Chief Justices until his retirement on Dec. 31, 2008. In 1991, Calogero received both the Louisiana Bar Foundation’s Distinguished Jurist Award and an honorary doctor of laws degree from Loyola University New Orleans. In 1992, Calogero received a master of laws degree from the University of Virginia. In 2005, he became one of the first inductees into the Louisiana Justice Hall of Fame. In 2007, the American Judicature Society awarded him the fourth annual Dwight D. Opperman Award for Judicial Excellence. In his honor, the Louisiana Bar Foundation instituted the annual Calogero Justice Award, which recognizes a local, state or national organization or individual who significantly contributes to Louisiana’s justice system. He is also the recipient of Loyola’s 2008 Integritas Vitae Award, presented by Loyola’s board of trustees to an individual who exemplifies the qualities Loyola seeks to instill in its students. As chief justice, Calogero spearheaded numerous reform initiatives in the administration of justice in Louisiana, many of which serve as national models of court improvement. Throughout his career, he participated in more than 6,000 orally argued cases and authored more than 1,000 majority opinions, in addition to multiple concurrences and dissents. Following his retirement, Calogero established his own private firm, mainly working on civil appellate cases. He is married to Leslie Langhetee and is the father of 10 children: Debbie Calogero Applebaum, and David, Pascal III, Elizabeth, Thomas, Michael, Stephen, Gerald, Katie and Chrissy Calogero. For more information, contact James Shields at 504-861-5888.